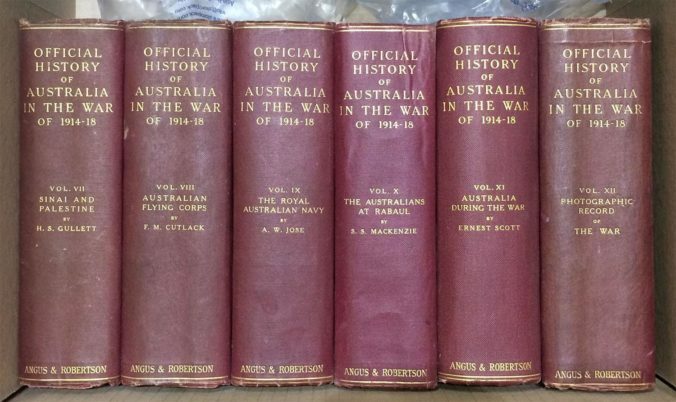 Volumes VII to XII of the official history "Australia in the war of 1914-1918"
The Official History of Australia in the War of 1914–1918 is a 12-volume series covering Australia’s involvement in the First World War. The series was edited by the official historian Charles Bean, who also wrote six of the volumes, and was published between 1920 and 1942. The books, with their familiar covers, “the colour of dried blood” in the words of one reviewer, rapidly became highly regarded internationally. Bean’s work established the tradition and set the standard for all subsequent Australian official war histories. This preface was written for the University of Queensland Press editions which were published in the 1980s and is applicable to all volumes. This volume was not included in this project, as all the original images are available within the collection.